Do you know about head vases? The name even seems strange, doesn’t it? I remember when I was a little girl my mom got a flower arrangement in a head vase. Years ago these were introduced by florists and were very trendy containers for floral arrangements. Now the problem was this: The size of the small vase made it impossible for florists to use a lot of flowers, and they could not charge a lot of money for these arrangements. Mom does not know what happened to her vase, but I recall the hat and the dress were black. Today these are collectibles, especially if you find one with the pearl earrings and necklace still intact. My friend Clay Chaffin gave me my head vase, dressed in powder blue. I love to put pale pink roses in it for a perfect petite arrangement. You are extremely lucky if you find a Lucille Ball or Jackie Kennedy head vase. You can still find great vases today at antique malls and shows. They would make a fabulous bridesmaid’s luncheon setting to have one at each place. Tell me: Do any of you collect these? What are your thoughts? I have this very one without the hat. I got it in 1968 when my daughter was born. I have two smaller ones I just bought. When I found that my dear friend Ann Dorer was managing editor of the new magazine Southern Lady, I rushed out to purchase a copy and fell in love!!! The lady head vases on the cover of that issue sent me back to my teenage years when I worked at a florist where we occasionally used those for very small floral arrangements. My collection began shortly thereafter. I now have a curio cabinet full of ladies, including Jackie Kennedy, Doris Day, and many other gorgeous ladies of yesteryear, thanks to my dear husband, family and friends! I fill them with flowers to match their outfits and place one at each place setting when I entertain at luncheons, asking each lady to sit with the “lady” whose style she admires the most. Thanks for the inspiration 15 years ago! I love these and don’t remember ever seeing them. I am hosting a Bridal Luncheon in June and would love to find a few of these. Such a fun thing to write about. I found you through The Enchanted Home and so glad I did. I have a head vase. Mine from childhood had a black parasol that is long gone. I tried to buy some from a large collection at an auction but the chop ladies from Maryland totally out bid me on every one! Beautiful table setting! So glad the Enchanted Home sent me here. How wonderful your blog is!! I have just learned about it from the Enchanted Home blog! Fantastic interview and truly loved it! Such an inspiration you all to all of us! So happy I found your blog now, I will share it with my mother who has all her old Victoria magazines as well! My aunt gave me a head vase several years ago. It’s dated 1956. It is not perfect, but I love it because it always makes me think of her. 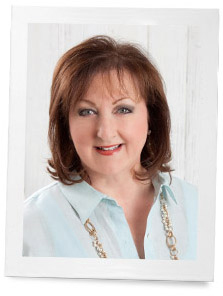 Loved your interview with Tina at The Enchanted Home. I love both your blogs, they are great! Well I had to click on this post when I saw it in your sidebar – I am giving a bridesmaid’s luncheon in my garden on May 30th – I guess you will find me on ebay searching for vases! One of my closest friends has one that belonged to her grandmother – perhaps she will lend it for the brides place setting! Great idea, thanks! What a lovely idea! I do not collect these, but I will be on the look out for one now. 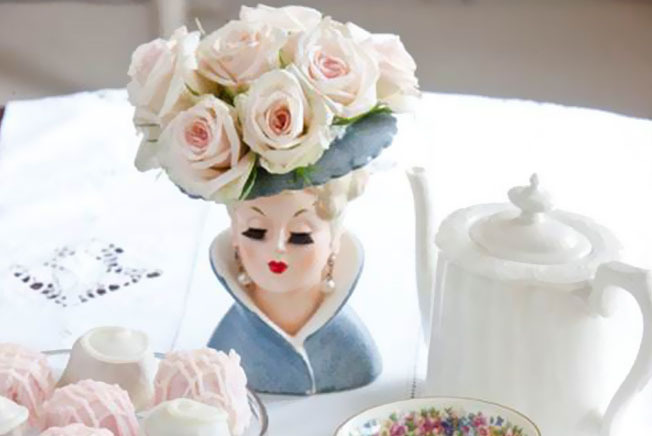 These head vases do bring back fond memories! I remember the black dressed head vases like your Mother had. Thank you for sharing such a lovely tablescape and idea! I am visiting from The Enchanted Home blog today. I signed up to follow your blog; I’m so happy to have found it. My Mother had a head vase sitting on her dresser. It had the pearl earrings & necklace. I wish I had kept it, but she had so much I could not keep it all. Seeing this one brings back childhood memories of a sweet time in life. I have never seen these before! How charming. I love the head vase ladies! I remember seeing them as a child, but my interest in them was really sparked when one appeared on the cover of one of your first Southern Lady magazines. My search for head vases was on from that point forward. My first lady came by way of an estate auction. She was at the very end of the auction because the fingers on her right hand, which is poised by her cheek, were broken off. She’s all white with gold accents. The bottom has a .99 cent stamp and the word JAPAN so I know she’s pretty old. The broken fingers aren’t even noticed as I have her “holding” a vintage handkerchief which covers the missing fingers. More vintage hankies are stuffed inside her which kinda makes it look like she has on a big feathered hat. The second vase also came from an auction where there were several head vases from which to choose. Of course, I wanted them all, but my husband wasn’t remotely interested in adding yet one more dust magnet to my collection. The bidding was steep, so I only ended up with one which is really more a young girl than a lady. She was made by Lefton and has a sweet face and blond ponytail. She holds old necklaces, some of which were made by my late mother. The third vase has the pearl earrings but is a reproduction. The stamp on the bottom says “Hand Painted Nippon” but I was told when I bought it that it was a reproduction. That’s something to keep in mind when buying these vases. There are new ones that look old but can be had for much less than the original versions. A buyer definitely needs to know what they’re buying before they shell out the big bucks for these lovely ladies. I still have mine from my childhood. I keep my makeup brushes in it. It still has the pearl earrings and necklace. She is pink and lovely. Reminds me of a simpler time. I have my maternal Grandmother’s “Lady’s Head Vase”. She still has her pearl drop earrings and necklace. My grandmother used it frequently, and I always loved it. It was perfect for a rose without enough stem for vase, or a Peony. The latter looks spectacular. I use it frequently, too, and it always makes me think of my Nana. What a lovely photo ! It is magical that an item such as a “ladies head vase” can evoke sweet memories of our past . Yes , I do recall the beautiful ladies in my Grandmother’s home long , long ago . When my daughter was married in 2012 , the theme for the Bridal Shower and the Bridesmaids luncheon was one to honor the elegant “Audrey Hepburn” . When the time comes for daughter #2 to marry , I will “borrow” your idea of the “ladies head vases” . when we have your blog to read ?Thank you for the bliss and for Victoria ! Thank you for your sweet note!! I adore head vases. So unique. They should make them again. I search all the time for one in good condition and usually have a nice price tag too. Tx for sharing. My aunt had quite a collection of head vases. When she & my uncle passed away, they left the house that had belonged first to my grandparents (1924) to me with all the contents. A curio cabinet was filled with the head vases. One was a Jackie Kennedy and several were from the 1940’s. I let my two daughters-in-law have their pick of the vases and of several other antiques. The ones they chose are now displayed in their homes. What a great idea to use them at bridal showers, Mother’s Day festivities, etc. Love your publications and your journal. I have been “lurking” and reading the comments on entries. You have brought back such wonderful memories of the “good old days” of growing up in the 50’s, of family traditions and fun. Thanks so much! I’m not from the South, but lived and taught school in Alabama in the 1960’s when my husband was stationed there. We are all about a beautiful life—No matter where our roots!! So happy you shared. Thank you. What a nice idea! I, too, have never seen one and will start my search – I guess many of us will be on the lookout now! It is adorable and probably a great conversation starter. Thank you for bringing this particular type of vase to our attention – hopefully I’ll find one soon. What a lovely idea. I’ll need to look for one. Yours is beautiful. My Mom made several head vases when she was taking ceramic classes in the 60’s. I still have them and like these gentle reminders of my childhood. That is very special. Love things that moms make! I’ve never seen a Head Vase. What an adorable addition to a table setting. I had never seen or heard of a head vase as my own Mother never had one. I came across one in an antique store a few years ago that was a nurse. I bought it as a gift for my daughter who was about to graduate from nursing school. She absolutely loved it! I bought a small head vase with pearl earrings and was thrilled to find it and at a half way decent price. They are so expensive. But I have never put flowers in it. I love how it looks. I am going to give it a try the next time I have someone to tea. I have a really pretty one that is the head of the Virgin Mary. My grandma always kept either lilies or roses in it. Love the pearl earrings on yours. I don’t collect them, don’t remember them either. I sure want to collect them now! Love them! Beautiful! I have a very nice one (Doris Day) that I found in a junk shop, and I knew it was valuable! I have not used it, but after seeing yours looking so pretty with the flowers in her hat, I will get mine out and see how pretty I can make her look! Thanks for sharing! Love it, love it! it is now my desktop background. Thank you. Lovely idea! Thanks for sharing. Oh, my! Now I LOVE that! I’ve spent my life around antiques and I don’t remember seeing one used like this before. For some of my relatives they weren’t “antiques”, they were just their old things they had. When my one grandmother sold her farm she wanted to get rid of “all her old stuff” and have new EVERYTHING. To her that meant an escape from the sacrifices of the depression, the war, and many hard years of farming. She even had an “everyday car” and a car to go to church on Sunday and for visiting. She had no clue how people scarfed up those old things of hers at the sale. Because of this my mother has very few things that had been passed down on her side of the family. On the other side, my dad’s family, they were the total opposite. A Grove never got rid of ANYTHING! and when I say anything I MEAN anything. I’m now living with much of this treasure but I don’t have a vase like this. I’ve been wanting to get to the antique places near me and now I have something special I’m on the hunt for. I’ve ALWAYS loved antiques all of my life even when the teenage girls around me wanted big, new, modern homes I’m the one that wanted the big old farmhouse to renovate. I didn’t get the big old farmhouse but I did get another family home 200+ years old for which I now sometimes question my sanity about wanting something that ALWAYS has things that either need to be done or I want to do. My mother-in-law had one of the flowerheads. I used it as a decoration in a bookcase for a number of years. I packed it away in my basement and now don’t remember if I still have it. I always liked it and now wish I could find it or another to use. It is especially lovely for a tea table. I wish you had a picture of it to share with us. I’m not sure what you mean by a “flowerhead”. I look forward to searching for these on my next antique treks. If your daughter does become engaged please stop by my website called: babiesbridesandlavender.com I have many bridal and baby shower favors and I must say just a little different from the norm. what fun! we never had these in England, where I grew up, I will keep my eyes open for one!! The head vase brought back wonderful memories of my own sweet Mother.